Carpenter ants are here! Have you noticed ants in your kitchen? what about in or around your bathroom? These large black ants are just coming out of dormancy and are hungry and looking to grow their colony. Carpenter ants are commonly found near damp or rotted wood. Have you seen any large black ants with wings? These ants are called the winged reproductives. The larger black winged carpenter ants are female and are future queens looking to establish a new satellite colony. If you find these ants in your home it should raise some red flags and prompt you to take action. Seeing the winged ants can tell you that you already have an established nest somewhere in or around your home and needs to be addressed before they cause any more damage. Carpenter ants are wood boring ants. Some people assume the sawdust or “frass” that is appearing is from termites. 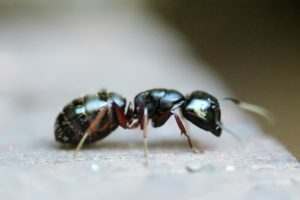 The difference between carpenter ants ant termites is that carpenter ants do not actually eat wood, they will bore through it whereas termites actually eat and digest the wood and are not too common in the Peterborough and surrounding areas. If you find any large black ants around your home please book an appointment for treatment as soon as you can to avoid anymore damage to your structure. Andy’s Pest Control services all of Peterborough and the Kawartha Lakes including Minden, Haliburton, and Bancroft. If you have any questions about how we treat for carpenter ants, and the 1 year warranty we offer please feel free to give us a call at (705) 760-3457 and get a free no pressure quote over the phone. We are here to help YOU, not your pests.